In one of my favorite parts of town, Little Little Tokyo (or Little Osaka if you swing that way), there is a Korean restaurant called Tofu Ya. Certainly, the existence of the word “tofu” within a restaurant’s name is a red flag for an unvegan, but while perusing the area one day, I found myself inside checking out the menu. It turned out that it wasn’t simply a vegetarian place and it smelled damn good, so we gave it a spin. 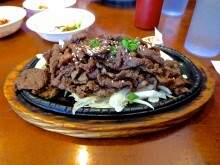 I ended up having more options than expected at a restaurant called Tofu Ya, but ordered a plate of Bulgogi Beef. Based on the picture in the menu, this deliciously seasoned beef appeared to have no vegetables accompanying it. Unfortunately, the menu was misleading, because the beef that was brought unto me rested on a bed of onions. Fortunately, they weren’t exactly mixed in and I was able to eat away at the beef without dodging the onions too much. The meat itself turned out to be really awesome. I always love me some bulgogi and Tofu Ya knew how to do it right. A couple pieces were overcooked, but this was balanced out by the tasty seasoning. There must be some lesson in this, like “Don’t judge a book by its cover,” but let’s be real here. If you put the word “tofu” in your restaurant name, the odds are unvegans are going to run away. I’m glad I didn’t in this case, but on the other hand, no matter how good of a vegan burger a restaurant like Fatburger offers, they are still going to struggle to attract those misguided people.